Many of us know people who seem to be more, what we would call, self-aware than others. Self-awareness is having a growing knowledge of yourself, your own issues, and how others might perceive you. A popular idea for understanding self-awareness is the Johari’s window, created by Joseph Luft and Harry Ingham in 1955. It is called Johari’s window because it is a diagram that looks like a window. See it below. Another way to look at the window shows how self and others work with the “window”. What the window demonstrates is that there is an area about us that is known to others AND to ourselves (white area), an area that is known to others, but not to ourselves (green), an area known to us, but not to anyone else (pink), and there is a part of us that we no nothing about and neither does anyone else…except for God (black)! 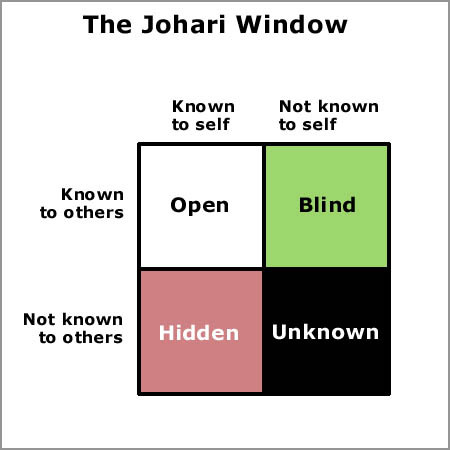 Johari’s window is used to encourage people to seek out great self-awareness through being open to feedback from others. As we grow in our self-awareness we also grow more aware of parts of us that are strengths and parts of us that are weaknesses…growth areas. Johari’s window also demonstrates how much we need other people…how much we need relationships. When we are in relationships with others, as hard as it can be at times, we grow as people. Relationships help us “watch our back”. We all have blindspots…parts of us that are not known to ourselves…parts that could be strengths or weaknesses. When we are “face to face” with someone in a relationship (literally and figuratively) they see what is “behind” us that we have no way of knowing. When a person has a close relationship it increases their chances of being aware of those blindspots…which is sometimes a painful aspect of relating to others! Getting feedback and growing as a result requires courage, strength, and vulnerability. Many people struggle with this part of relationships. In fact, those who shun relationships or tend to back away from them are in danger of having larger blindspots. They are in danger of not being as self-aware…which only perpetuates the cycle…because you and I both know how challenging it is to be in a relationship with someone who is NOT self-aware in the first place! Relationships, community, interactions…these ARE important parts of our lives. We cannot be whole people without them. If you like Simon and Garfunkel’s song “I Am a Rock”…remember…they were being quite sarcastic. Johari Window was our final in my Trauma Class and I learn a lot about myself that all these years I had placed in the back of my mind and know that I’m studying to be a counselor it was easier to work on the unresolved issues.